As Belarus leader Lukashenko is set to meet with Ukrainian President Petro Poroshenko tomorrow July 20, a rally was held by Belarusian community and Belarus-born volunteers outside the presidential administration in Kyiv, RFL/RL's Belarusian service. Activists were seen holding white-red-white [Belarusian national] and Ukrainian banners, according to Radio Svoboda. 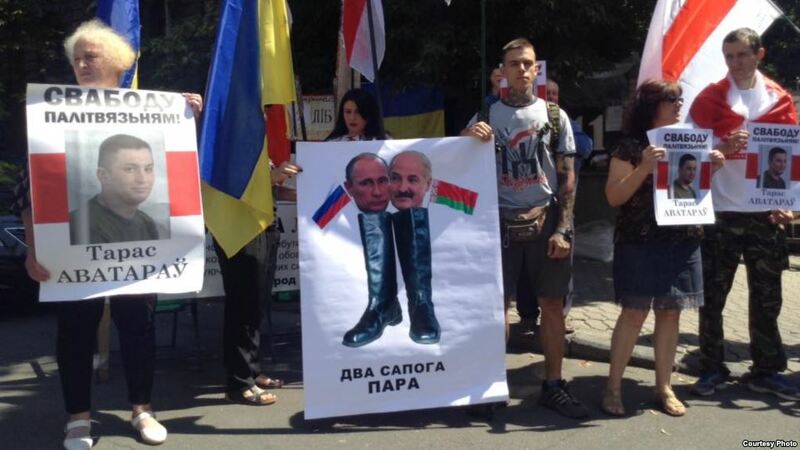 Participants of the picket also hold posters with portraits of Russian President Vladimir Putin and Belarusian President Alexander Lukashenko with a caption "Two boots of a Couple," as well as portraits of a Belarusian volunteer, Taras Avatarov, who has been sentenced in Belarus to a five-year prison term, in a case opposition deems politically motivated. Taras's mother, Lyudmila Pospekh, was also attending the picket. Read alsoLukashenko assures Russian-Belarussian military exercise West-2017 not to turn into invasion of UkraineAs reported earlier, President of Belarus Alexander Lukashenko will visit Ukraine this week, Deputy Prime Minister of Belarus Vladimir Semashko said at a meeting of the Ukrainian-Belarusian intergovernmental commission on trade and economic cooperation.